Security Guard Training 8 Hour Guard Card & The Complete 40 Hour Required Security Guard Training Course (Modules 1 & 2), * Firearms Training, * Firearms Requalification, Baton, Pepper Spray, Taser Certification, Two (2) Day Proprietary Private Security Officer (PPSO), Three (3) Day School Security Guard (SB 1626) & American Red Cross Approved First Aid, CPR & AED Training as well as CPR/AED for Professional Rescuers & Health Care Providers . Register ONLINE today! *One (1) Day Enhanced Citizens Firearms Training for those interested in self-defense and home protection. Includes the fundamentals of handgun safety in a classroom and ½ day at the range firing different types of firearms. Includes Handgun Safety Certificate (HSC) Testing & Certification. Register ONLINE today! *Two (2) Day Citizens Self Defense Training for those interested in self-defense and home protection. Includes the fundamentals of handgun safety in a classroom and ½ day at the range firing different types of firearms. Includes Handgun Safety Certificate (HSC) Testing & Certification. Also included: Citizens Pepper Spray Training, Citizens Stun Gun Training & Red Cross Approved Adult CPR/AED Training & Certification. Register ONLINE today! Students must be at least 18 years old to attend training. 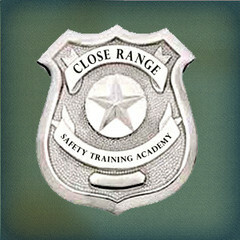 Close Range Safety Training Academy was created to promote safety and protection service through training. Our staff is dedicated to instructing our students in all facets for the purpose of safety, security and defense to better serve their community. We provide a cohesive set of training sources to instruct and enhance the skills of our learners. Given our certified and licensed staff, we offer a quality learning and critical thinking atmosphere in order to interactively engage with our students in the development of their preparation experience.